Bates students, faculty and a New York choreographer all show dances in the Bates College Modern Dance Company’s Annual Spring Concert of New Work. A profusion of material means the concert is presented in two programs in Schaeffer Theatre, 305 College Street: Program A, 7:30 p.m. Thursday, March 20, and 4 p.m. Saturday, March 22; and Program B, 7:30 p.m. Friday, March 21, and 2 p.m. Sunday, March 23. The public is welcome to attend at no charge; seats fill fast. For more information, please call the Schaeffer box office at 207-786-6161. The Dance Company’s Amy Hempstead, a junior from Yarmouth, choreographed “Déjà Vu,” a work for six dancers that depicts the emotional confusion around a failed relationship. 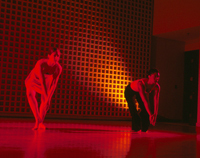 Julie Yeterian, a first-year student from Waterville, offers the trio dance “I Almost Went to Bed Without Remembering,” which explores the sleeper’s resistance to awakening. Two dancers each present multiple works. Yuzo Yamazaki, a junior from Kanagawa, Japan, has created a duet, a large-ensemble piece and a solo that he will dance himself. Aisha Bell, a senior from St. Louis, Mo., offers two quartets, a quintet and the solo “Spiritual,” which she will perform. The concerts also feature large-ensemble pieces by two faculty members: “Luna Amor” by Robin Vermilion, who teaches ballet, and “Didn’t Find It” by W. Barry Dean, who teaches hip-hop. A work by Ben Munisteri, a well-known New York City choreographer, will also be performed. Marcy Plavin , director of the college dance program and founder of the dance company, directs the concerts.